The man who put the magic into a Hornchurch Theatre took his last curtain call on Thursday February 8, to a packed house who witnessed outstanding accolades and a standing ovation that even turned the officiating clergy into a stand up comedian. 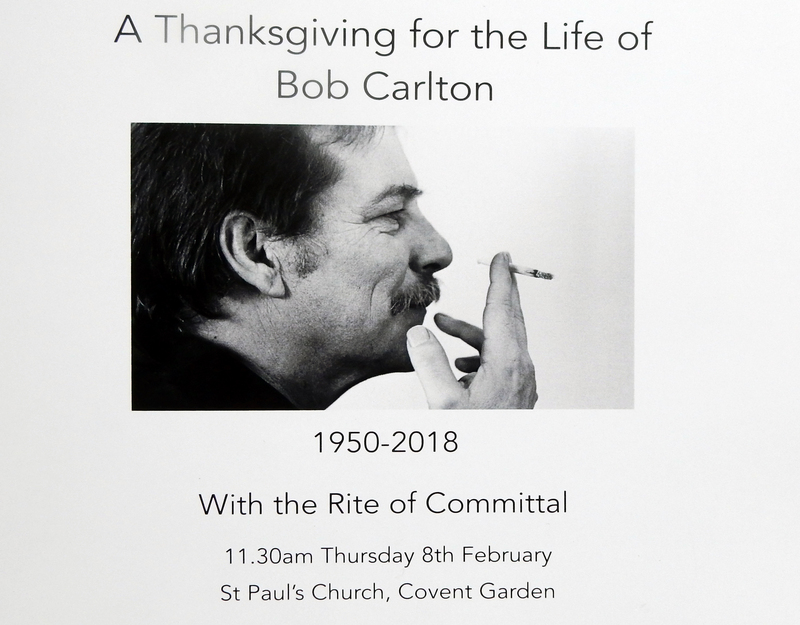 Bob Carlton, former Artistic Director of the Queens Theatre Hornchurch passed into immortality in January, another victim of the dreadful scourge of Cancer. In a remarkable service that accurately reflected the man and his life, the high five ambience, love, tears and memories permeated through every heart and soul of his last audience of friends, colleagues and admirers, even down to a mass congregation rendition of 1963 hit by the Crystals, ‘The Do Ron Ron.’. It was not a time for sadness, the believers at his Committal at St Paul’s Church in Covent Garden, suitably known as the Actors Church, were not going to allow it. In turn they created a last night to remember and one that his achievements not only generously deserved, but he had earned for his inspirational magical touch in seasons of excellence in productions at Hornchurch’s Queens Theatre. The mourners gathered were worthy of autograph hunters’ best efforts, for they were part of the Carlton fabric that created the legend of Hornchurch Queens Theatre and turned on the spotlights that shone for so many years. Bob was the Queens Theatre, and it was right that the professional company he created, Cut to the Chase’ were in the chorus on the day. Many famous names and recognisable faces, but an attempt to name them for fear of missing one out would be unforgivable; but equally unforgivable not to mention his stalwarts, Matt Devitt and Julian Littman and Bob’s brave daughter Emily who added a moving tribute to her dad. Bob Carlton was a remarkable man who gave unflinchingly and shared his gifts with others. In return they filled the church with a magnificent memorial in narrative and song creating the ambience of theatre within the holy walls to the man who guided their Hornchurch years . It was a professional performance of eloquence and skills in which love and sincerity in words and actions, made the memory of their artistic director into a memorial to a man who will never be forgotten and whose name will remain linked to Hornchurch to eternity – and beyond. 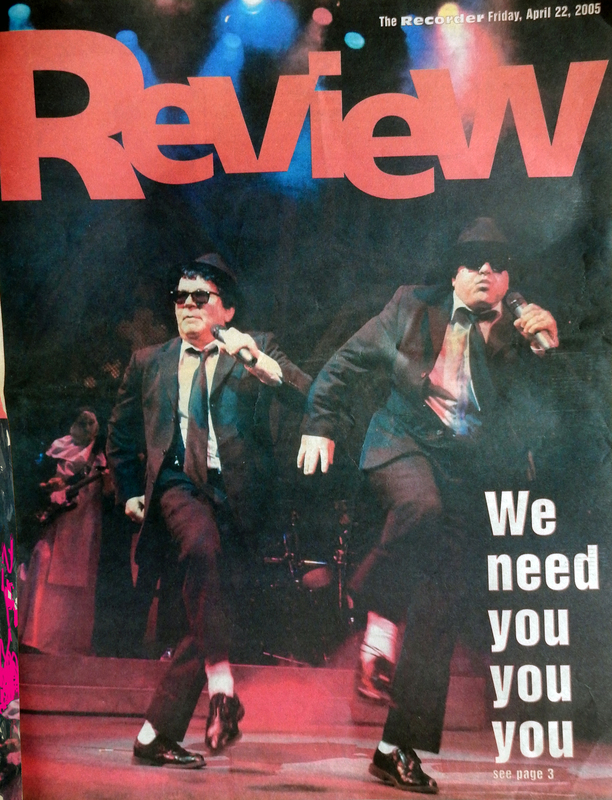 A typical front page of the Romford Recorder’s Entertainment section hailing the birth of a new production form the Carlton mind-set of original thinking and treading new grounds in theatre entertainment. Linking Shakespeare’s COMEDY OF ERRORS with elements of The Blues Brothers, starring Matt Devitt, Julian Littman, Georgina Field and James Earl Adair, and other actors all from the Cut to the Chase professional Company created by Bob Carlton. The critics wrote: “No one actually wanted to go home after the show, they all seemed to be talking about the show which was probably one of the best top to bottom productions seen in Hornchurch. This was the foundation on which the Carlton legend is based. It continued to bring in the patrons and cemented on record the achievement of filled auditoriums and high ticket sales. A record of success and so it was. 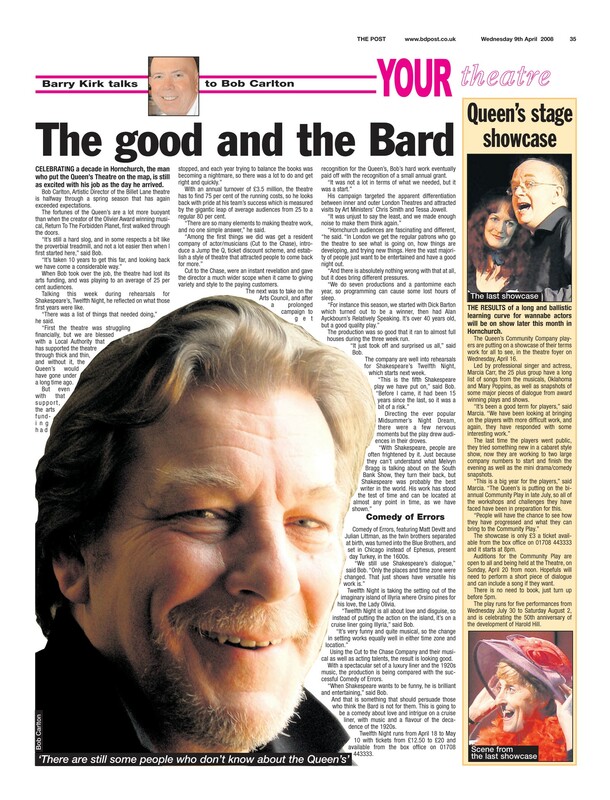 Only the third Shakespeare play to cross the boards in two decades, and it left Hornchurch wanting more and more. The Queens Theatre was good for Bob Carlton and equally Bob Carlton was good for the Queens Theatre. He brought an era of magic that spread the word of the value of theatre and all those who work within the walls as well as a recognition of their talent and skills in turning an entertainment into a life experience. Something those of us in Hornchurch will never forget. I first met Bob about two weeks into my job as Production Manager at the Queens Theatre Hornchurch at a meeting about Face a musical co-production he co-wrote and directed that was to open at the Queens. I remember some while later, just after he had started as Artistic Director at the Queens he came into my office shut the door and asked about the finances of Face, I only later realised that he thought that the then Administrator was about to use me as a scapegoat for the loses that Face made, and he wanted to have my back. He could be a real friend like that, despite the fact I went into that first meeting wearing an Aston Villa badge, years later he told me how much Villa were hated in Coventry and of the time the Belgrade Theatre management inadvertently painted the foyer claret and blue much to the disgust of many locals. When Bob took over the Queens it was in a state with small houses, a failing building, low morale, and had lost its Arts Council grant, but he had the self-confidence (and let’s face it the ego) to believe he could put all this to rights, and my 6 years working with him there were amongst the best and most enjoyable of my career. We got a lot more people wanting to come through the doors, started to replace the failing infrastructure (not many Directors outlive a dimmer installation), and become an Arts Council client once more. All this done by presenting popular work to a high standard, with a company of actor/musicians. While it was great producing the “digitally remastered” Forbidden Planet, I was most proud of the revivals of Lionel Bart’s musicals (shame we never had a go at Twang! !, but even Bob’s ego had some limits), and plays like Brighton Rock with a jazz score. Bob understood the financial constraints placed on show budgets, and it was a real help to have his support as we tried to turn sows ears into silk purses, but this did not mean we did not have ambition technically, I remember how terrific the start of Glass Menagerie was with the set floating on air castors from the back of the deep Queens stage, it worked perfectly in every rehearsal, but doggedly had stage fright in every Preview, and we had to cut it. Not that everything between me and Bob was always sweetness and light, I remember during the tech rehearsals for Forbidden Planet he wanted to cut the model rocket flying across the auditorium after the first attempt (this followed two other effects that he cut in previous shows when I thought we could get them to work) I stood up and said no way were we going to cut it after one attempt, it was rare for me to be so vociferous, and the room went deadly quiet, I think Bob quickly realised this time he needed to back down, as normally I am happy to let directors vent there wrath at me as I am thick skinned and know it is not personal. One final memory is of walking past his office while he was tapping away at his laptop oblivious to the smoke drifting out of the litter bin behind him he had been flicking fag ash into, I calmly popped into the laundry opposite and filled a jug with water, I did think of pouring it over him, but passed him by and emptied the jug into the bin. Great memories, thanks Bob, gone but not forgotten. That model rocket now has Capt. Tempest on the flight deck, shame we can’t reverse polarity.